We created this site to serve people who are interested in college funding. What makes us unique is that we list a broad array of funding opportunities without asking for information from you. There are no long forms to fill out in order to access our resources. For example, you can find any of the following without filling out forms with your personal information. We give you a list of available funding sources, and let you quickly move on to the application process. As the recipient of financial aid during my college years, I know every last dollar helps. Back in 1998, when I was a college freshman, I received Stafford Loans and Pell Grants. I didn't search for other funding opportunities because I did not know they existed. Due to financial concerns and family issues I had to drop out. Our original site was launched in 1999. 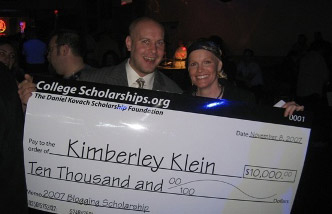 Due to its popularity, we rebranded as College Scholarships.org on May 29, 2007. Students can now search via the internet to find innumerable financial aid opportunities. Students can browse through funding options for certain health conditions, sports, majors, minorities, religions, and military service among other categories. College Scholarships.org gives students the information they need as quickly as possible. As someone who believes in the Laws of Wealth, I am a big supporter of charity and donations. I figured I should combine my beliefs with the focus of this web site and offer scholarships to deserving college students. After talking with the other founders of this web site, a valiant effort was put forth to extend our own scholarships. Just a few decades ago a high school education was valid enough to sustain most Americans through their lifecycle. No executive positions, but decent jobs with minimal skill requirements could be had. Today, the climate of education and the work place has changed drastically. Not only do most decent jobs require a college education, but more and more are demanding advanced degrees. As these economic demands have increased, so has college and university tuition costs. In fact, college tuitions have well outpaced increases in middle class America’s incomes, leaving many without the necessary money required to pay for a college education. Nearly everyone is eligible, we’ve discovered, for some sort of scholarship, grant, or other financial assistance. Armed with the information we have collected here, we are confident you will find more untapped reserves than you might have imagined. Due to email questions from site users we extended College Scholarships.org to cover the following additional topics including testing and distance learning. In the future we expect to exand the site further. Please provide feedback if you would like to help us make this site better for users. The most popular grant is the Federal Pell Grant, which is need-based. But your search shouldn't stop there. Since grants and scholarships both give out money that does not have to be paid back, it's worth your time to look over any grant programs that you may qualify for. Conveniently, we categorize a variety of college grant offers much like our list of scholarships. Browse the grants available for nursing, minorities, the disabled, and more. If you need a loan, you'll probably be getting one or more Federal Stafford Loans. These can be subsidized or unsubsidized depending on your financial situation. The other popular federal loan is the Perkins Loan. You can access these federal funds direct from the Department of Education, financial organizations, and participating banks. Spending time to compare each offer from all of these providers will get you the best loan rates and benefits. It can be of great assistance to browse our student loan section. After the federal financing is exhausted, you can then ask for student-targeted 'alternative' loans from banks and financial institutions. We also review the offers from many of the most popular loan providers such as Citibank, Sallie Mae, and Bank of America. After graduating you can look into consolidating your loans using both traditional and non-traditional funding sources. America’s educational climate has been in the spotlight on more than a few occasions. Federal and state government officials are well aware of the costs to fund a high quality education. And the news continues that America falls behind some of their international competition. Besides grants and scholarship programs, most state governments have instituted sponsored savings plans, often referred to as 529 programs. These state funded investment plans give families and students a tax-free savings option for saving and managing educational monies. In fact, most state governments allow out of state individuals to participate, so consumers have more options in savings plans.